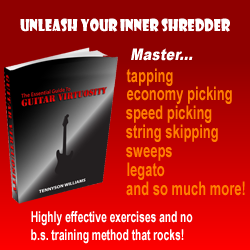 Tennyson is author of The Essential Guide to Guitar Virtuosity, which is an excellent ebook we recommend and can be downloaded from guitarspeedsecret.com. He’s just sent us this brand new article on guitar tone, if you enjoyed reading it then make sure you visit his site! Guitar playing can generally be condensed into two categories. Your technique and style, and your tone. In this article we’re going to be talking about tone, and the importance of refining it. I see too many guitar players who have a zillion guitar effect pedals, and I try not to open my mouth, but then they start playing, and its absolutely unbearable. Guys, seriously, don’t compensate with toys. Take the time to improve your playing, because all the goodies in the world won’t make you a better guitar player. Also, using too many pedals and effects can be bombarding to the listener, and it also kills the strength of your overall sound. If you spend most of your time playing through a clean setting on your guitar, don’t think for a moment that you are not affected by this. I’ve witnessed a lot of clean guitar players who are bad for this as well. If you can find the discipline to limit yourself a little bit, then you will see just how awesome a tone you can get. For instance, deciding to build a pedal board is a great way to tackle the problem of guitar pedal self indulgence. Sure, you could by a pedal board brand new, but they are expensive, and many won’t fit your needs. Building your own pedal board is fun, rewarding, and helps you to get a good idea of how you’re going use your tone. Remember, when you’re building a pedal board, you’re also building your tone, because you’ll need to determine what goes where, and what goes before what. Invest part of your time into becoming a smart consumer. Don’t just settle for any old pedal off the shelf, and don’t ever assume that because a pedal is really expensive, that its the best and is the best for you. Try out all sorts of pedals, and you’ll find that the oddest effect pedals compliment each other. In example, using a clean setting with a very light amount of delay (really short delay) can give you a nice and rich “creamy” sound for chords. If you experiment, you’ll find all sorts of tricks like this, which helps you to determine the layout of your pedal board. Don’t forget to put this down on paper first, and certainly don’t forget to measure the dimensions of the pedals, and account for the space needed between each one for your cables. Now I’m not saying that building a pedal board is the only way to do this, but it does help to nudge you in the right direction, because if you do something like this and find that perfect sound, you’ll probably freak if anyone so much as breaths in the direction of an effect pedal knob. So make sure that you ask questions of yourself. I’m sure that you have your own opinions about what sounds good to you. Perhaps you like a touch of of the flanger, or maybe a little wah, or some chorus action in their. Regardless of what it is that you want, refine and come up with a plan.